I'm developing a part of an application that's responsible for exporting some data into CSV files. The application always uses UTF-8 because of its multilingual nature at all levels. But opening such CSV files (containing e.g. 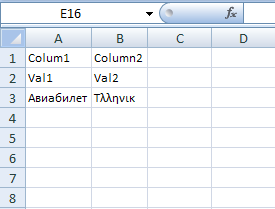 diacritics, cyrillic letters, Greek letters) in Excel does not achieve the expected results showing something like Г„/Г¤, Г–/Г¶. And I don't know how to force Excel understand that the open CSV file is encoded in UTF-8. I also tried specifying UTF-8 BOM EF BB BF, but Excel ignores that. P.S. Which tools may potentially behave like Excel does? I have to say that I've confused the community with the formulation of the question. When I was asking this question, I asked for a way of opening a UTF-8 CSV file in Excel without any problems for a user, in a fluent and transparent way. However, I used a wrong formulation asking for doing it automatically. That is very confusing and it clashes with VBA macro automation. There are two answers for this questions that I appreciate the most: the very first answer by Alex https://stackoverflow.com/a/6002338/166589, and I've accepted this answer; and the second one by Mark https://stackoverflow.com/a/6488070/166589 that have appeared a little later. From the usability point of view, Excel seemed to have lack of a good user-friendly UTF-8 CSV support, so I consider both answers are correct, and I have accepted Alex's answer first because it really stated that Excel was not able to do that transparently. That is what I confused with automatically here. Mark's answer promotes a more complicated way for more advanced users to achieve the expected result. Both answers are great, but Alex's one fits my not clearly specified question a little better. Five months later after the last edit, I've noticed that Alex's answer has disappeared for some reason. I really hope it wasn't a technical issue and I hope there is no more discussion on which answer is greater now. So I'm accepting Mark's answer as the best one. The UTF-8 Byte-order marker will clue Excel 2007+ in to the fact that you're using UTF-8. (See this SO post). In case anybody is having the same issues I was, .NET's UTF8 encoding class does not output a byte-order marker in a GetBytes() call. You need to use streams (or use a workaround) to get the BOM to output. The bug with ignored BOM seems to be fixed for Excel 2013. I had same problem with Cyrillic letters, but adding BOM character \uFEFF did help. "When I was asking this question, I asked for a way of opening a UTF-8 CSV file in Excel without any problems for a user,..."
The answer marked as the accepted answer with 200+ up-votes is useless for me because I don't want to give my users a manual how to configure Excel. Apart from that: this manual will apply to one Excel version but other Excel versions have different menus and configuration dialogs. You would need a manual for each Excel version. So the question is how to make Excel show UTF8 data with a simple double click? "I also tried specifying UTF-8 BOM EF BB BF, but Excel ignores that." A solution is to not use CSV at all. This format is implemented so stupidly by Microsoft that it depends on the region settings in control panel if comma or semicolon is used as separator. So the same CSV file may open correctly on one computer but on anther computer not. "CSV" means "Comma Separated Values" but for example on a german Windows by default semicolon must be used as separator while comma does not work. (Here it should be named SSV = Semicolon Separated Values) CSV files cannot be interchanged between different language versions of Windows. This is an additional problem to the UTF-8 problem. Excel exists since decades. It is a shame that Microsoft was not able to implement such a basic thing as CSV import in all these years. However, if you put the same values into a HTML file and save that file as UTF8 file with BOM with the file extension XLS you will get the correct result. You can even use colors in HTML which Excel will show correctly. Had the same problems with PHP-generated CSV files. Excel ignored the BOM when the Separator was defined via "sep=,\n" at the beginning of the content (but of course after the BOM). So adding a BOM ("\xEF\xBB\xBF") at the beginning of the content and setting the semicolon as separator via fputcsv($fh, $data_array, ";"); does the trick. I have had the same issue in the past (how to produce files that Excel can read, and other tools can also read). I was using TSV rather than CSV, but the same problem with encodings came up. I failed to find any way to get Excel to recognize UTF-8 automatically, and I was not willing/able to inflict on the consumers of the files complicated instructions how to open them. So I encoded them as UTF-16le (with a BOM) instead of UTF-8. Twice the size, but Excel can recognize the encoding. And they compress well, so the size rarely (but sadly not never) matters. This command inserts the UTF-4 BOM if not present. Therefore it is an idempotent command. Now you should be able to double click the file and open it in Excel. Go to menu Encoding→Convert to UTF-8. Open the file in Excel . Worked in Microsoft Excel 2013 (15.0.5093.1000) MSO (15.0.5101.1000) 64-bit from Microsoft Office Professional Plus 2013 on Windows 8.1 with locale for non-Unicode programs set to "German (Germany)". This is an old question but comes up in the search at top. I found after a lot of efforts that adding BOM characters at the beginning of csv file helps. Save it in Personal.xlsb to have it always available. Personalise excel toolbar adding a macro call button and open files from there. You can add more formating to the macro, like column autofit , alignment,etc. Just for help users interested on opening the file on Excel that achieve this thread like me. I have used the wizard below and it worked fine for me, importing an UTF-8 file. Not transparent, but useful if you already have the file. Click on the Data menu bar option. Click on the From Text icon. Navigate to the location of the file that you want to import. Click on the filename and then click on the Import button. The Text Import Wizard - Step 1 or 3 window will now appear on the screen. Choose the file type that best describes your data - Delimited or Fixed Width. 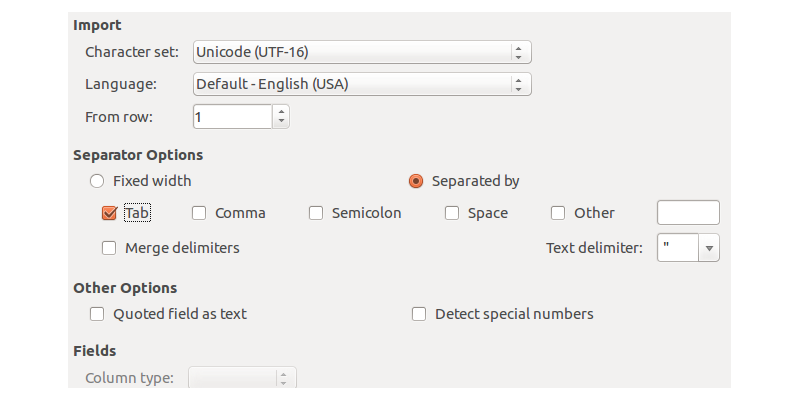 Choose 65001: Unicode (UTF-8) from the drop-down list that appears next to File origin. Click on the Next button to display the Text Import Wizard - Step 2 or 3 window. Place a checkmark next to the delimiter that was used in the file you wish to import into Microsoft Excel 2007. The Data preview window will show you how your data will appear based on the delimiter that you chose. Click on the Next button to display the Text Import Wizard - Step 3 of 3. Choose the appropriate data format for each column of data that you want to import. You also have the option to not import one or more columns of data if you want. Click on the Finish button to finish importing your data into Microsoft Excel 2007. Format 6 is the .csv format. Set Local to true, in case there are dates in the file. If Local is not set to true the dates will be Americanized, which in some cases will corrupt the .csv format. A truly amazing list of answers, but since one pretty good one is still missing, I'll mention it here: open the csv file with google sheets and save it back to your local computer as an excel file. In contrast to Microsoft, Google has managed to support UTF-8 csv files so it just works to open the file there. And the export to excel format also just works. So even though this may not be the preferred solution for all, it is pretty fail safe and the number of clicks is not as high as it may sound, especially when you're already logged into google anyway. hi i'm using ruby on rails for csv generation. In our application we plan to go for the multi language(I18n) and we faced an issue while viewing I18n content in the CSV file of windows excel. Was fine with Linux (Ubuntu) and mac. We identified that windows excel need to be imported the data again to view the actual data. While import we will get more options to choose character set. But this can’t be educated for each and every user, so solution we looking for is to open just by double click. Then we identified the way of showing data by open mode and bom in windows excel with the help of aghuddleston gist. Added at reference. File can be opened directly by double clicking. Had the same issue where writing out CSV text data to a file, then opening the resulting .csv in Excel shifts all the text into a single column. After having a read of the above answers I tried the following, which seems to sort the problem out. Apply an encoding of UTF-8 when you create your StreamWriter. That's it. If you want to make it fully automatic, one click, or to load automatically into Excel from say a web page, but can't generate proper Excel files, then I would suggest looking at SYLK format as an alternative. OK it is not as simple as CSV but it is text based and very easy to implement and it supports UTF-8 with no issues. I wrote a PHP class that receives the data and outputs a SYLK file which will open directly in Excel by just clicking the file (or will auto-launch Excel if you write the file to a web page with the correct mime type. You can even add formatting (like bold, format numbers in particular ways etc) and change column sizes, or auto size columns to the text in the columns and all in all the code is probably not more than about 100 lines. It is dead easy to reverse engineer SYLK by creating a simple spreadsheet and saving as SYLK and then reading it with a text editor. The first block are headers and standard number formats that you will recognise (which you just regurgitate in every file you create), then the data is simply an X/Y coordinate and a value. // Use UTF8 encoding so that Excel is ok with accents and such. Your mileage may vary - I'm using .NET 4 and Excel from Office 365. I tried everything I could find on this thread and similar, nothing worked fully. However, importing to google sheets and simply downloading as csv worked like a charm. Try it out if you come to my frustration point. Not the answer you're looking for? Browse other questions tagged excel csv utf-8 or ask your own question. How to GetBytes() in C# with UTF8 encoding with BOM?